After testing out the new features, BibleForge.com has been updated to to reflect the latest development. A few months and 1,639 changes later, the configuration menu for BibleForge is almost complete. The changes have landed on the testing server and should make it to bibleforge.com in a few days. (It still needs to be tested more throughly on IE.) Right now, there are just two configurable settings: Red Letters and Paragraphs. Both can be turned on or off. This is just the beginning, Lord willing. Many more options are planned. Also, the look and feel of BibleForge has undergone a minor update. Most notably, there is a slight drop shadow separating the top bar from the text. Below is a screenshot demonstrating the new features and design. What do you think? Just a quick update to let you know that the a lot of work has been done behind the scenes to add a the ability for the user to configure BibleForge. There won’t be a lot of options at first, but more will come in time, Lord willing. 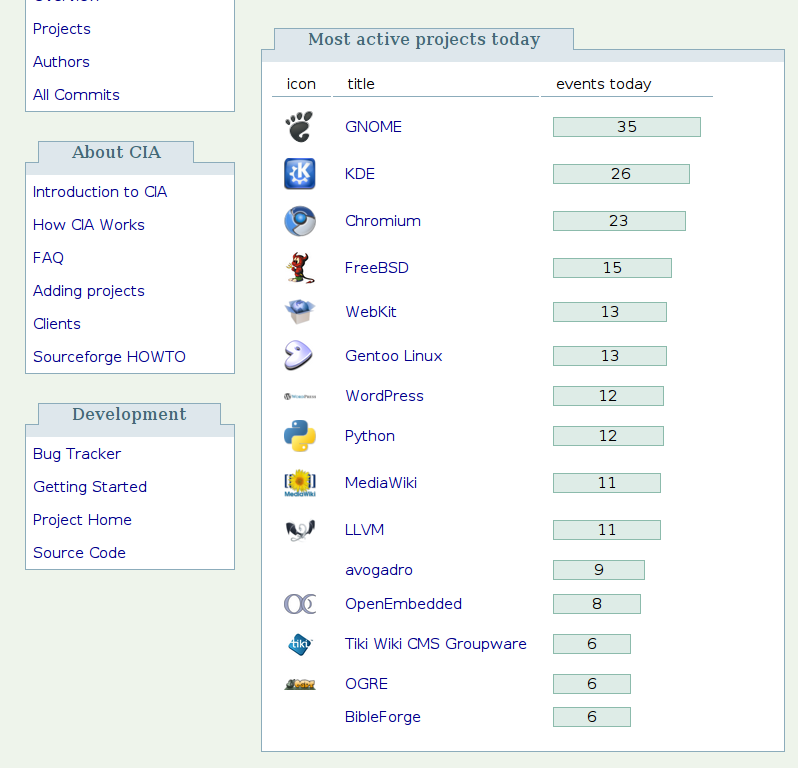 Also, I’m including a screen shot of CIA.vc showing BibleForge in the daily Top 15 most active project. The day is young, however, and I’m sure it will be beaten out soon, but even still, I thought it was neat. The main BibleForge server now has paragraphs as the default view, which is for the time being, the only view. The next step will be to let people customize BibleForge and choose which view they like. But for now, I hope everyone enjoys the paragraphs. It took longer than I hoped, but the paragraph mode is essentially ready. The code still needs to be cleaned up and documented, but it should land on the test server (bibleforge.net) before long. At the moment, there is no method to switch between the current verse-by-verse view and the up coming paragraph view. Work will begin on that soon. I’ll post an update when paragraphs are ready for beta testing. Paragraphs have been added to the database files in the repository. These paragraph breaks should be considered preliminary. Lord willing, they will be human reviewed and corrected as needed. Code still needs to be written to utilize the new paragraphs breaks. This should not take too long. I finished examining the original KJV manuscripts printed in 1611 as well as a printed version that I own with paragraph marks. Running a comparison of the two findings reveals that there are 995 different paragraph markings between the two. Some of those differences could be my mistake, but I have double checked some of it to be sure. So, I’m praying and thinking about what to do next. I also have paragraph data from several digital sources as well—all of which differ by a large amount as well. Paragraph divisions, like verse and chapter divisions, are not inspired because the original manuscripts did not have any (expect for a few places, like the Psalms), but the placement of paragraphs can change the meaning of a passage. I will probably come up with some sort of algorithm to examine the data I have collected and choose the most likely paragraph divisions. But it would be best to have some people examine the verses by hand and choose the best places for paragraph breaks. I hope to do that one day, but it is not very practical for the time being. Hopefully, I will get a preliminary text with paragraphs breaks soon.